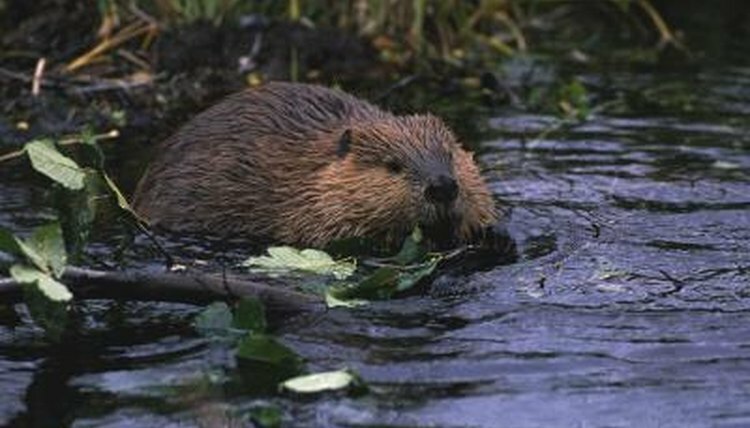 Beavers are the world's largest rodent, weighing up to 60 pounds and reaching 4 feet in length. They build their houses on lakes, rivers, creeks and streams. Up to nine beaver will live in the same lodge, although the average is four to eight. Beavers use their homes as a place to rest, raise their young and for protection against predators. Before building a house, beavers carefully select a location. Usually, they choose a place that is close to a reliable food source. Beavers eat leaves, bark and twigs of various trees including alder, aspen, willow and cottonwood. Ferns, grass and domestic crops, particularly beans and corn, are also part of their diet. Beavers may build their homes close to shore, or they may construct their lodge further out in the water. The most important factor is for their home to hover over an area that is at least 5 to 6 feet deep. This allows them to dive into the water without being seen when exiting a doorway from the floor of their home. Beavers begin constructing their homes by piling logs, sticks and shrubs around a water door, which gives them access to the river or pond. Once the walls are constructed, beavers use mud as insulation. Each year they add more sticks and mud to their home, creating a heavily fortified fortress. Walls can be 2 to 3 feet thick, providing a secure environment for those inside. When a beaver is safely tucked in his home, bears are the only natural predator strong enough to penetrate the dwelling. Beavers employ their teeth to cut down the trees and limbs used to construct their homes. Fallen trees and limbs are held in their powerful jaws and dragged to their building site. Beavers dive under water and use their forelegs to scoop up soft mud. Swimming to the surface they stand erect, using their tails to balance their body as they deposit armfuls of mud onto their house. The interior of a beaver home consists of one large room, which houses the entire family. This room is 2 to 3 feet high and 4 or 5 feet wide. The floor is peppered with a thin layer of bark, grass and roots. If more space is needed, beavers will chisel away the twigs and mud from one wall to expand their home. What Materials Do Otters Use to Build Shelter?